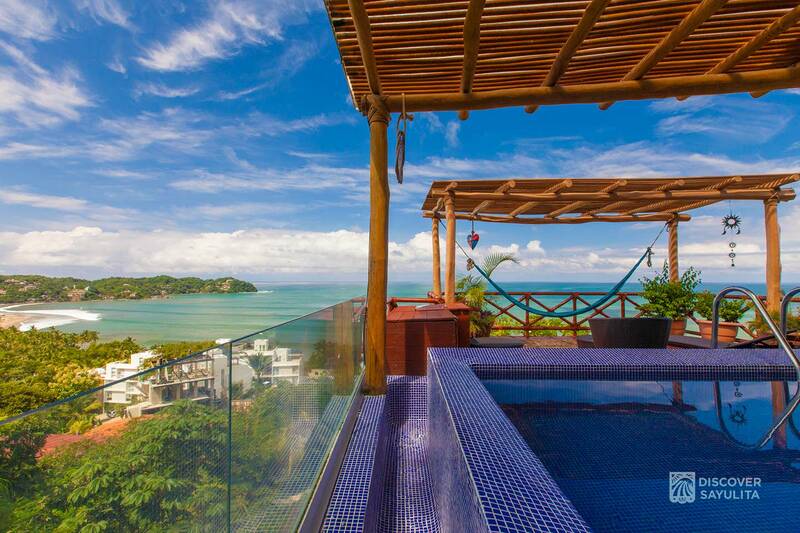 Villa Lucia in the Pajaro de Fuego complex in Sayulita is a brand new penthouse offering breathtaking views of the entire bay of Sayulita. 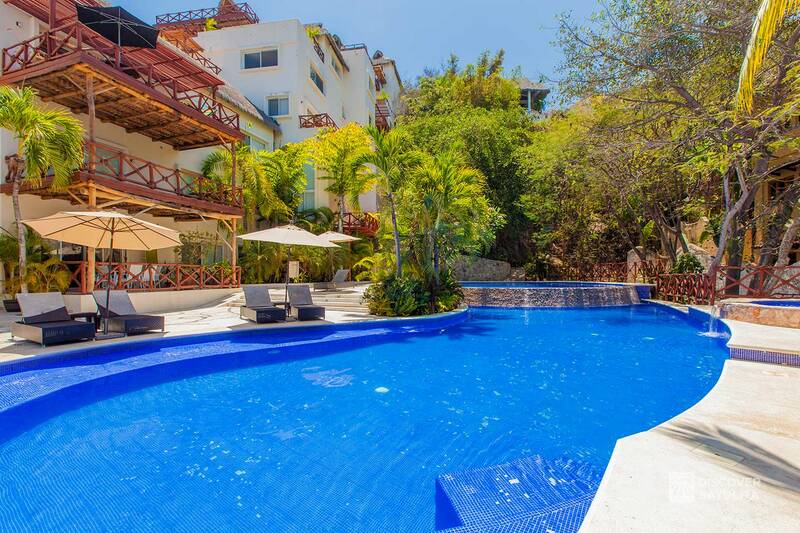 This two-story condo boasts a heated private pool and three spacious balconies overlooking the ocean. 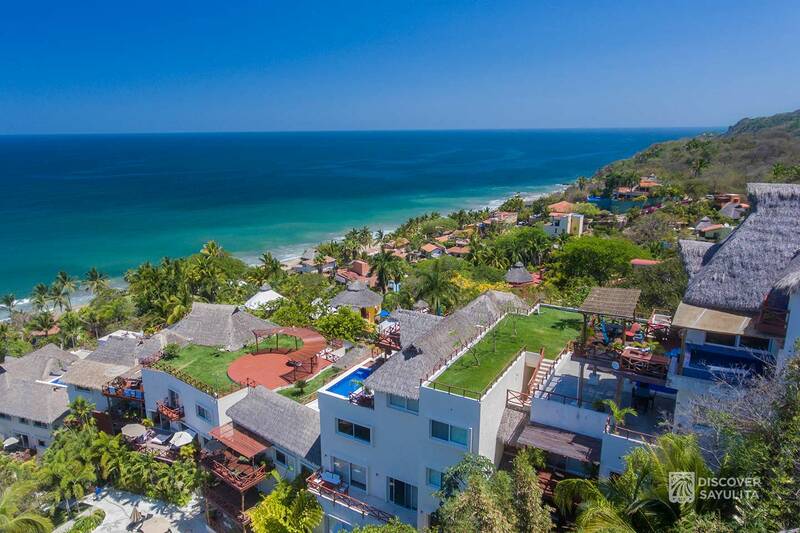 Villa Lucia in the Pajaro de Fuego complex in Sayulita is a brand new penthouse offering breathtaking views of the entire bay of Sayulita. 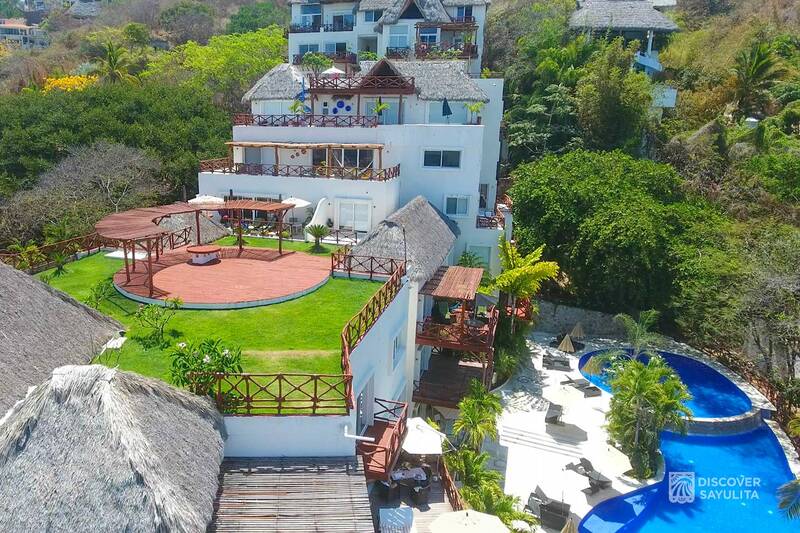 This two-story condo boasts a heated private pool and three spacious balconies overlooking the ocean, mountains and surrounding jungle. 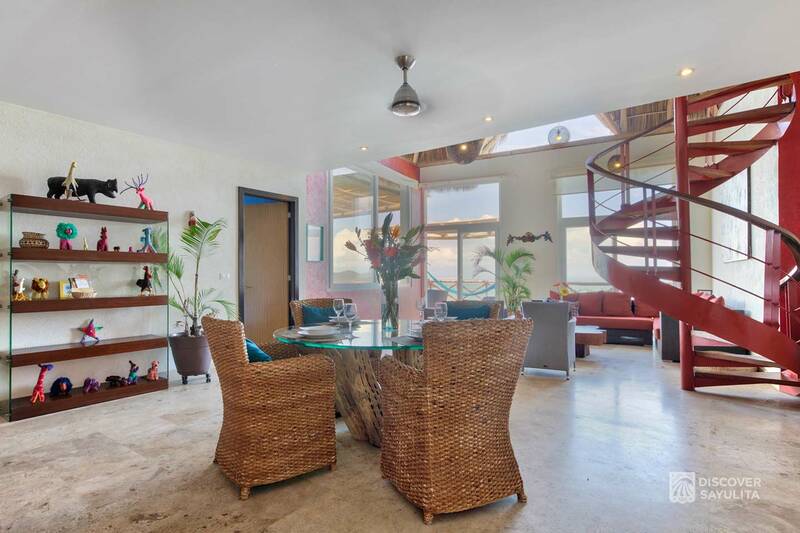 The loft-style floor plan is perfect for entertaining. 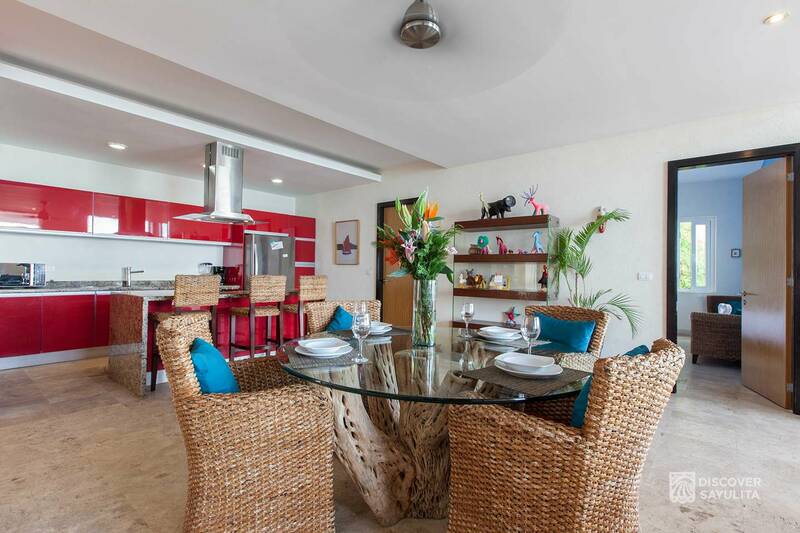 Relax in one of two living areas, dine in or hire a private chef. 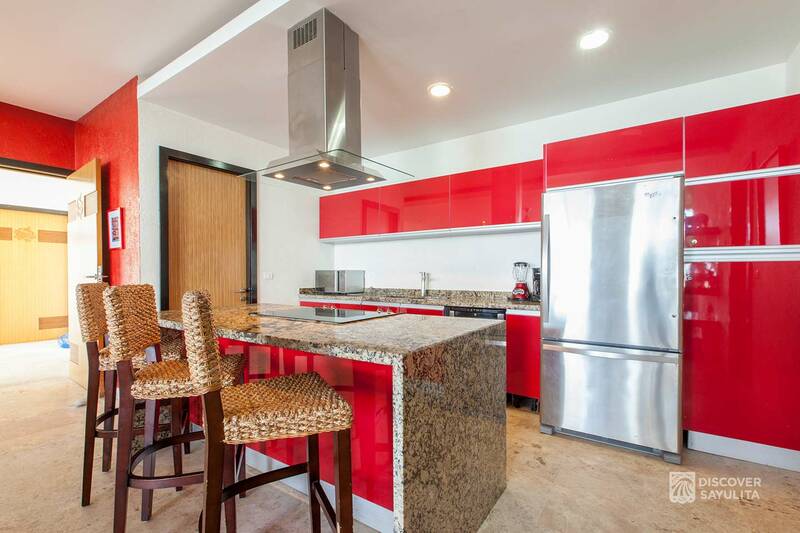 The modern kitchen includes a wine cooler, flat-top electric stove, and breakfast bar opening out to the living and dining area. 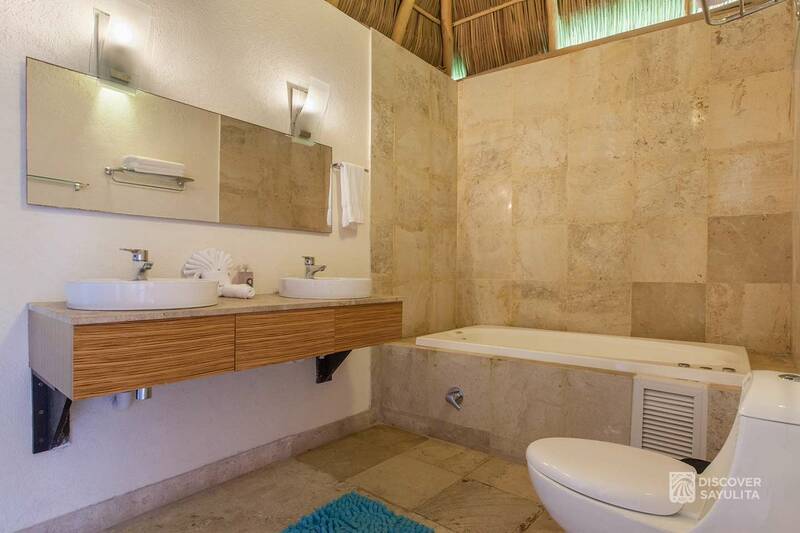 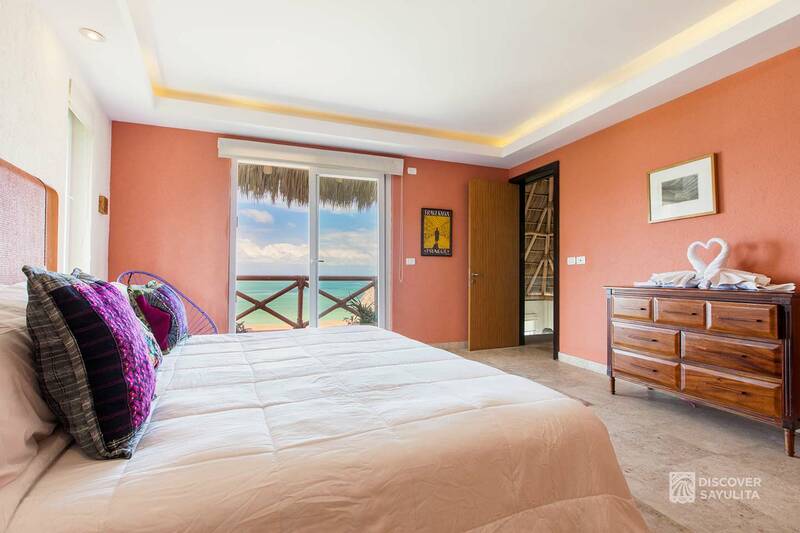 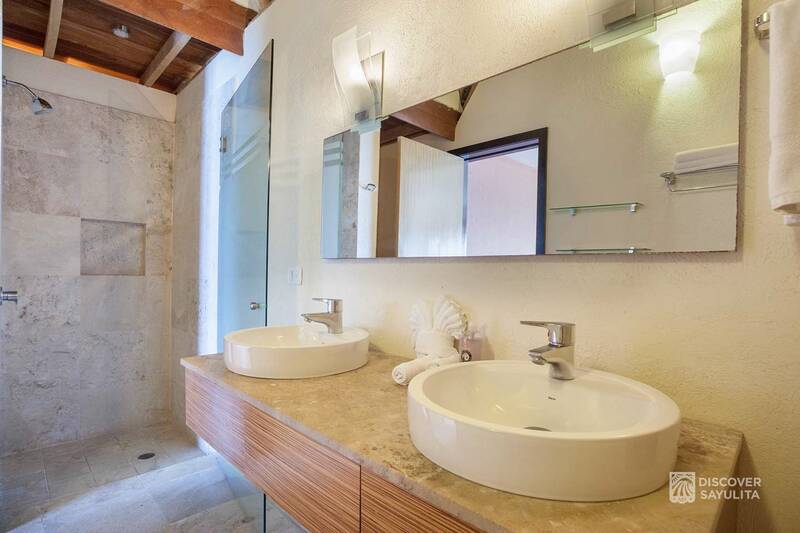 The master suit is set under a romantic vaulted palapa rooftop with a private balcony and jacuzi tub. 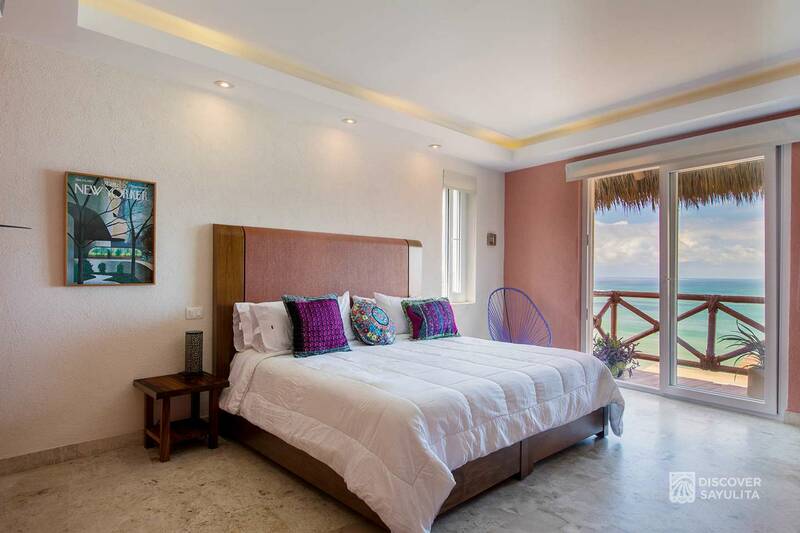 Enjoy ocean views from every room, watch the sunset on the bay, swim in the private heated pool, or relax in your jacuzi. 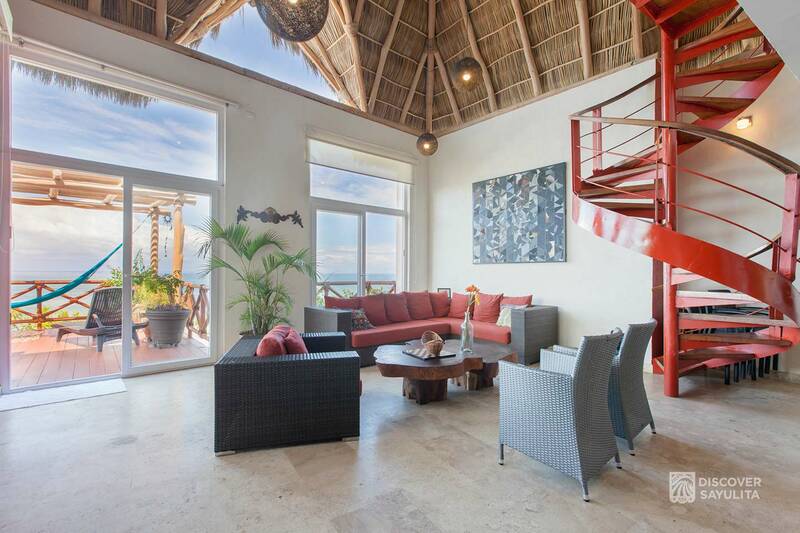 The first-floor living area leads to the main balcony and pool, sunchairs and a swinging hammock overlooking the Pacific Ocean. 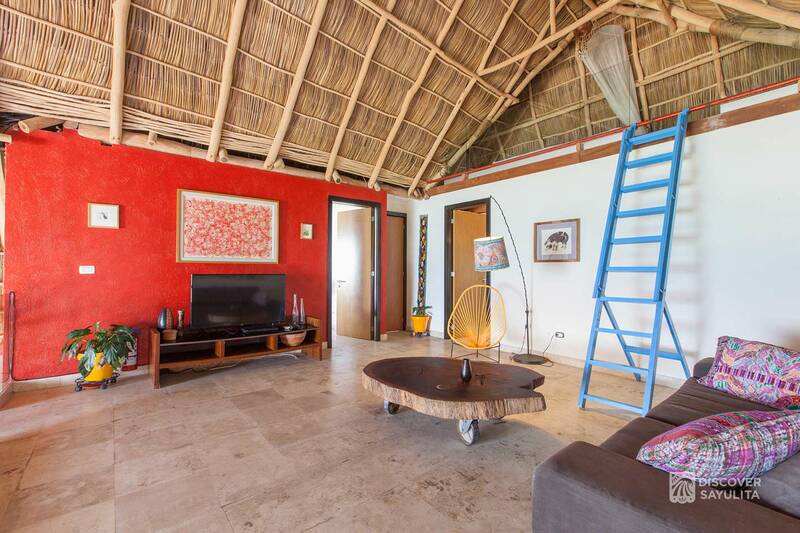 The upstairs, second level loft is set into the high palapa roof and boasts two bedrooms extending from the TV and lounge room. 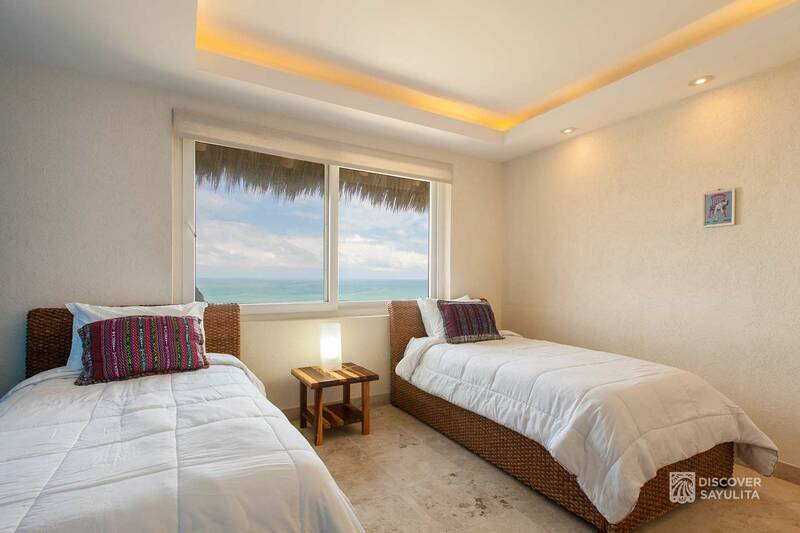 One room has two twin beds, the other a king-sized bed. 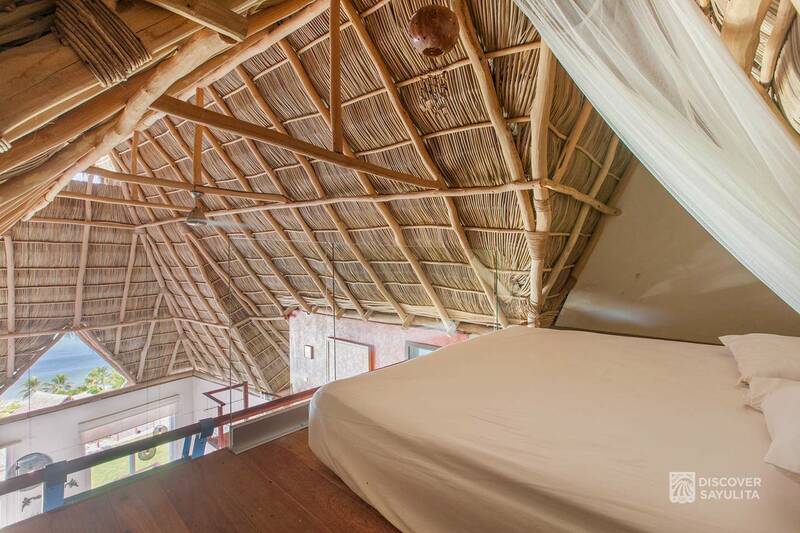 There is a fourth sleeping area with a queen-sized bed in the loft which is reached by a secure ladder. 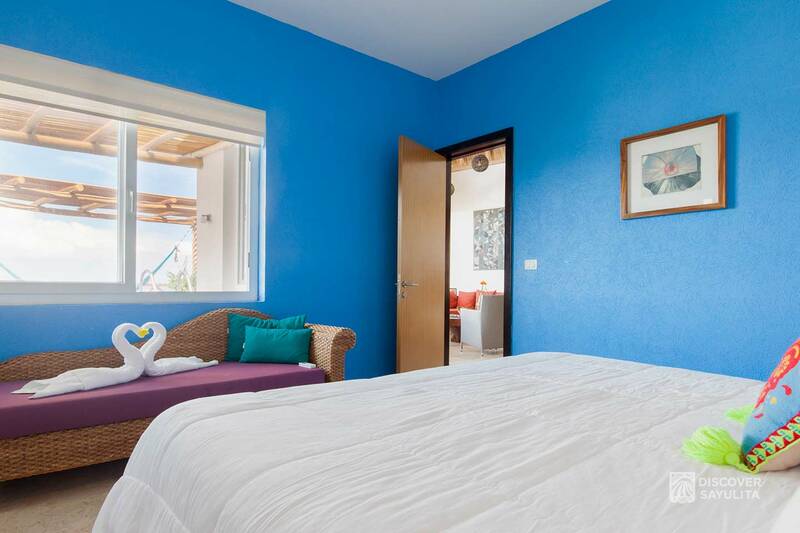 This is a great place to sleep kids in the family or any additional guests. 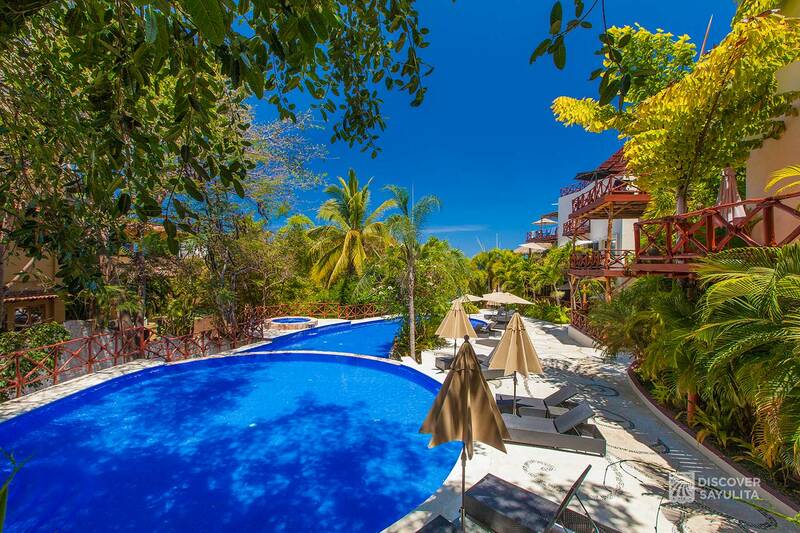 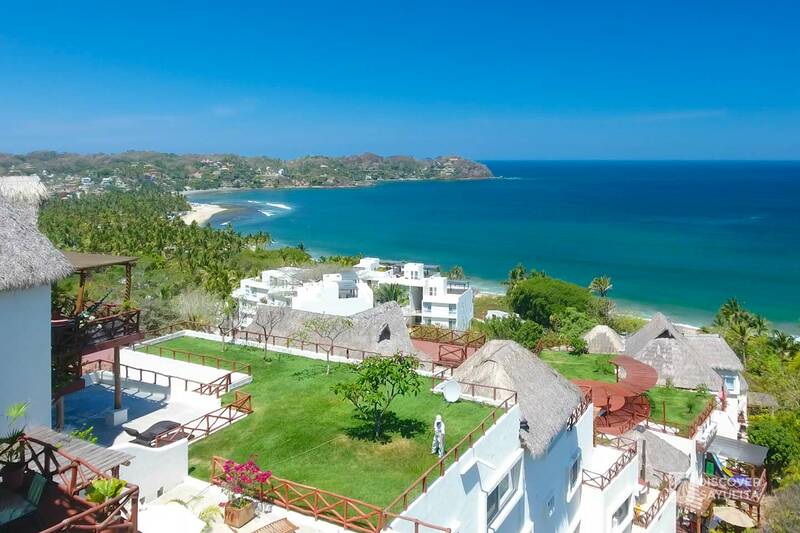 The Pajaro de Fuego complex is located on the tranquil north bay of Sayulita, a short walk to the town plaza. 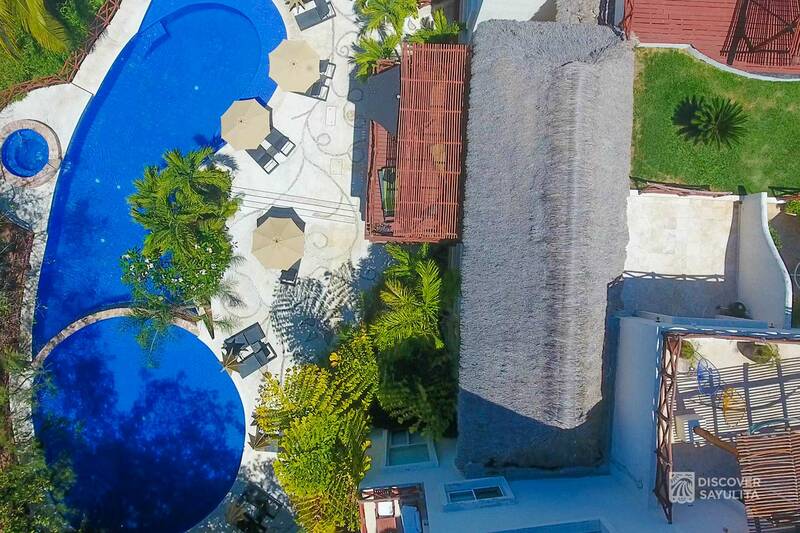 Soak in infinity pools and whirlpools, watch the sunset from the roof gardens, and enjoy the tranquility of tropical gardens. 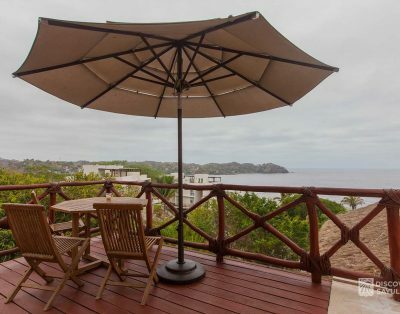 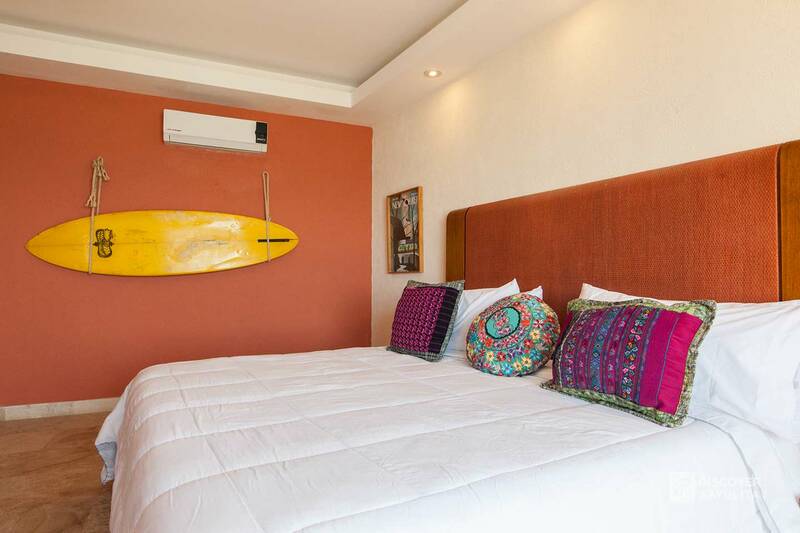 The Villa Lucia penthouse is ideal for families and couples seeking comfortable and luxury accomodations in beautiful Sayulita. 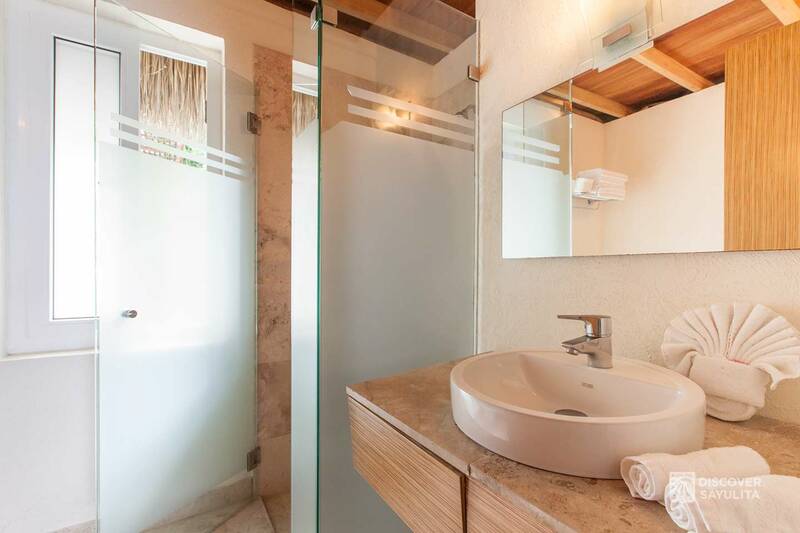 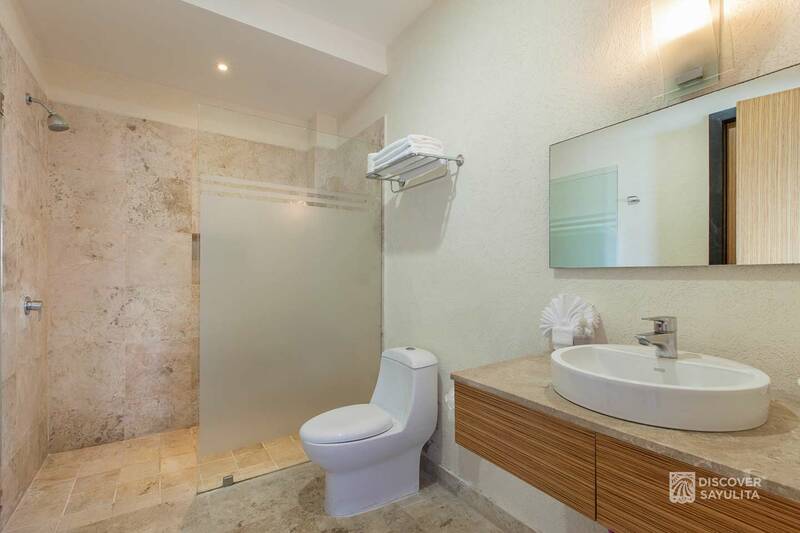 Villa Lucia includes a private heated pool, garage parking, daily maid service and concierge services. 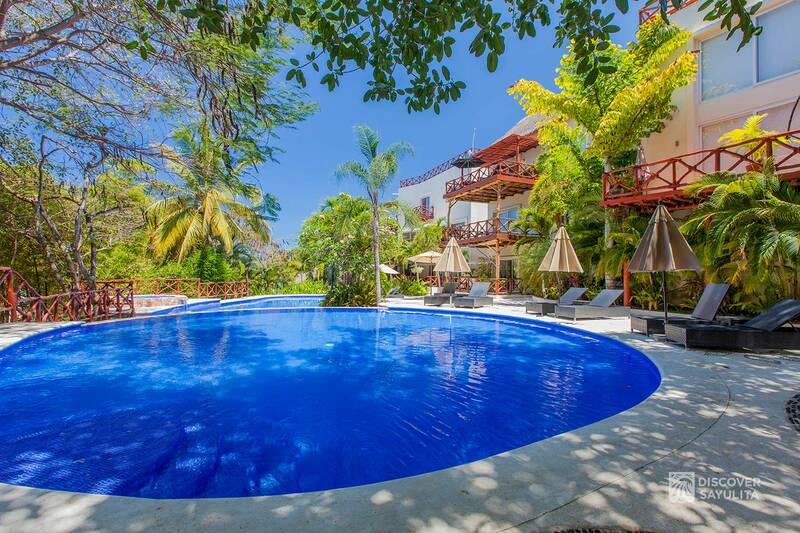 Our common area infinity pools are the largest in Sayulita. 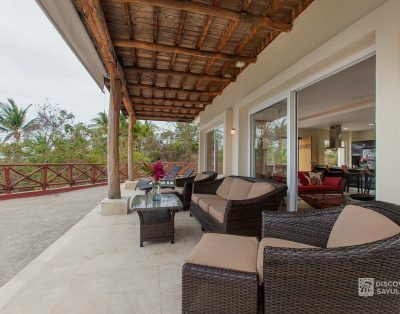 We have 24-hour security and on-site staff. 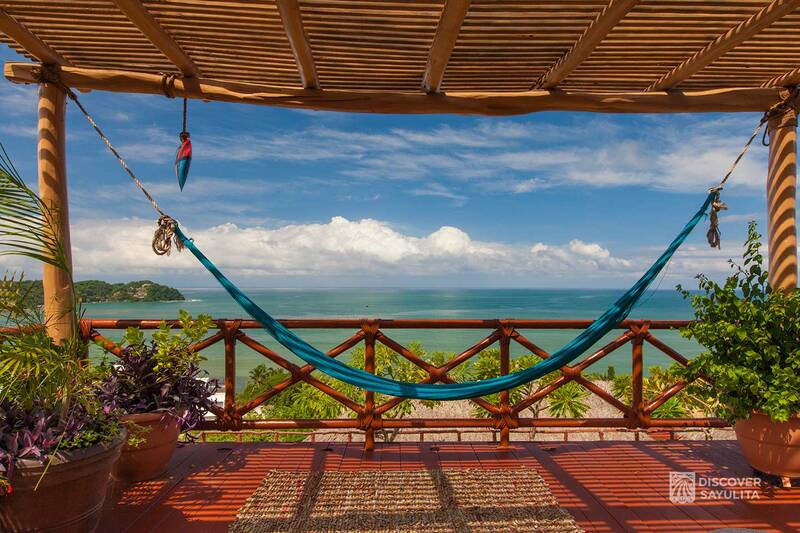 Our office staff are on-site daily to help arrange everything from surf lessons to jungle hikes. 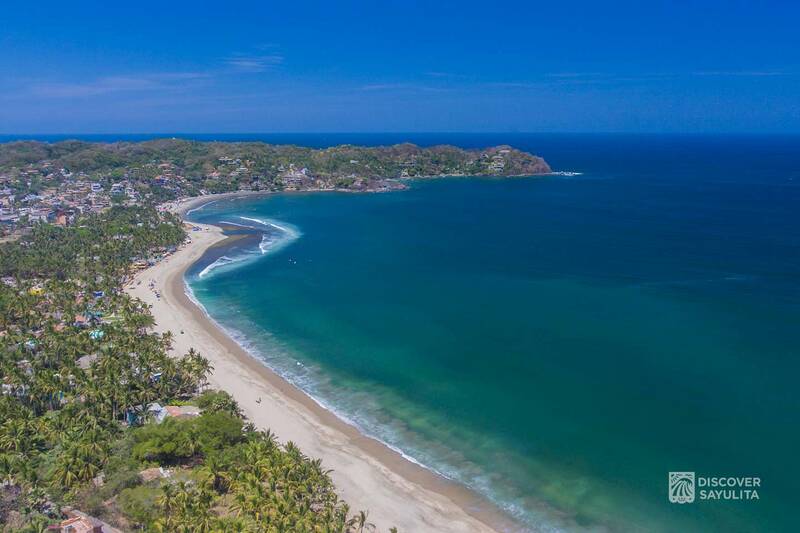 I am personally available to schedule airport transfers and other concierge services both before and during your stay. 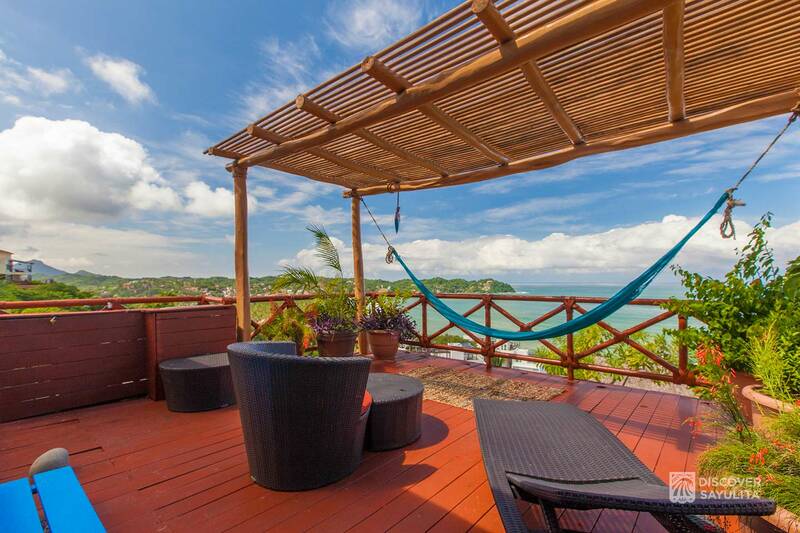 Villa Lucia is on an upper floor with stairs to climb to reach the top. 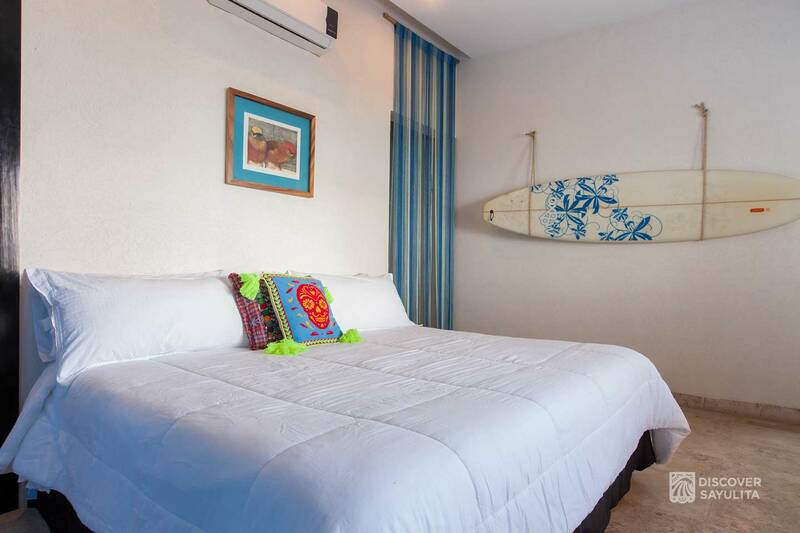 You can also rent a 4 wheel drive vehicle to park right next to the unit. 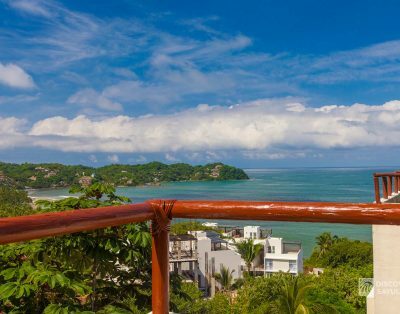 The view is quite breathtaking – you see the entire bay and town below. 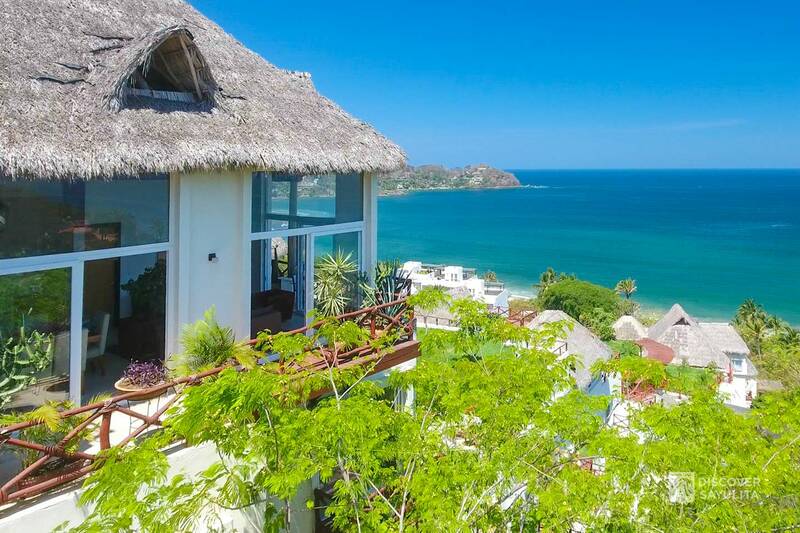 This is the perfect retreat villa.